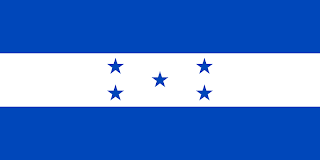 This flag of Honduras was adopted on January 9, 1866. The flag of Haiti was adopted on February 25, 1986. The top half is blue and the bottom is red. In the center is the coat of arms of Haiti which consists of a palm tree accompanied by several flags. There are two cannons mounted on either side of the palm tree. The banner underneath displays the national motto. 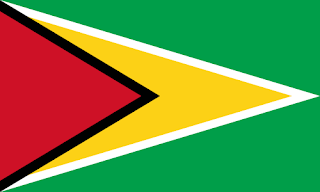 The flag of Guyana was adopted in 1966. The colours are symbolic: green for agriculture and forests, white for rivers and water, gold for mineral wealth, black for endurance, and red for zeal and dynamism. 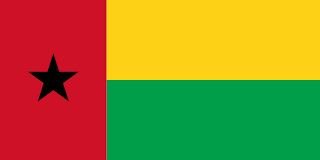 The flag of Guinea-Bissau was adopted in 1973. The flag features the traditional colors of gold, green, red, and also the Black Star of Africa. The red is for the blood of martyrs, green for forests, and gold for mineral wealth. The flag of Guinea was adopted on November 10, 1958.